Caffiend is the easiest way to stay on top of your caffeine consumption. Many sleeping problems can be traced to drinking too much caffeine during the day. With Caffiend you can always know how much caffeine you have had to drink. Quickly enter your frequently drank items by saving them as Quick Drinks. Open the app, tap one of Quick Drinks, confirm and you’re done! We also offer a large database of frequently updated drinks, foods and other items that contain caffeine. If you like to mix your own drinks, we also support custom items. You can even adjust your serving size (up to 10x) if you feel like having a little extra. 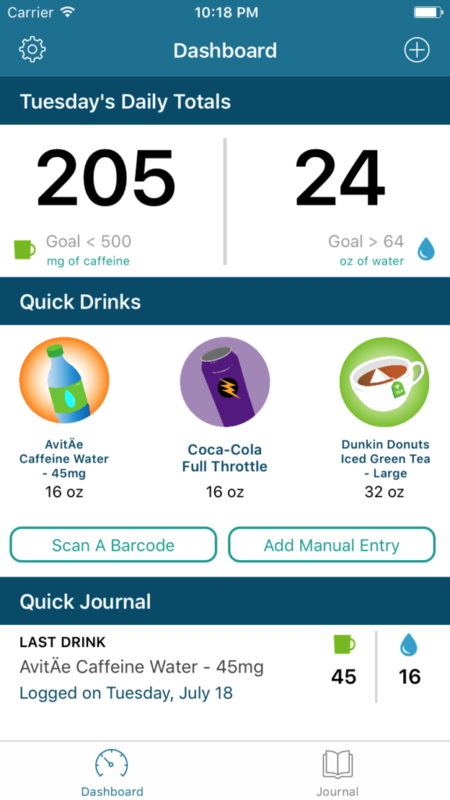 And now in Caffiend 1.7.5 you can now scan in items with a built in barcode scanner or enter any amount of caffeine or hydration with a Manual Entry. We realized that not everyone is exactly on time, we added the ability to choose when your chosen drink will be added to the Journal (in case you forgot.. or are planning ahead!) Oh did we mention the Journal? It keeps tracking of everything you intake, every day and at what time. With a swipe you can edit or remove erroneous entries from Caffiend – and we automatically pull them from Health.app too! Oh, about that…. 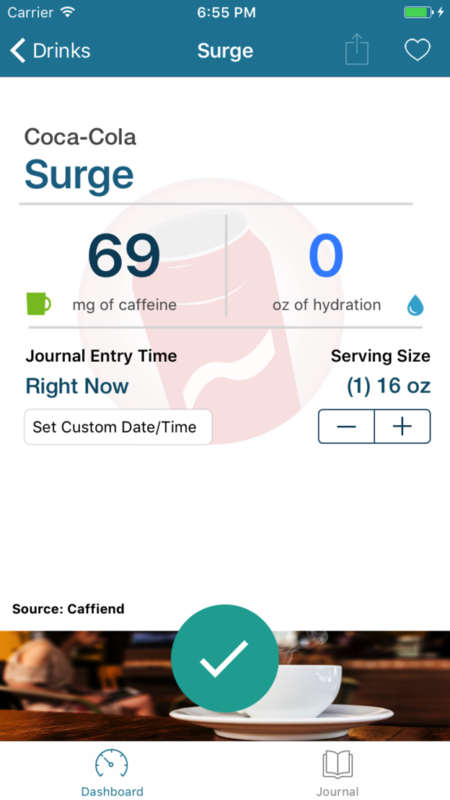 …all of this caffeine data is synced to iOS Health for easy long-term monitoring by you, your health professional, or sharing with other health apps. In Caffiend 1.7.5 we know populate daily totals from Health, so items entered in other Health compatible apps will contribute towards your totals. We have also made many improvements to the interface. When adding a drink, you will now see Recents and Favorites. Recents will show you the last 10 items you have added to Caffiend. Meanwhile we realized that Quick Drinks were a great feature, but some people had more than three favorite drinks. To satisfy their thirst, any item can be added to your Favorites listing. You can add as many items as you would like to Favorites as well. We polished up the interface, adopted Apple’s new San Fransisco font, revamped the Caffiend home screen (it scrolls! ), added indicators to current values in Settings and more. You can also now search for a drink in iOS Spotlight and jump directly to it in the app! 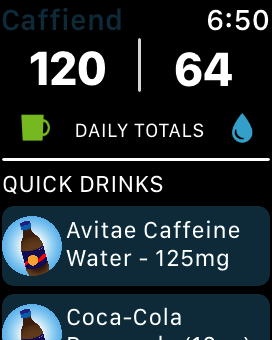 If you have an Apple Watch, you can also use Caffiend for Apple Watch to quickly glance at your current caffeine and/or hydration intake without even taking your phone out of your pocket. If watches are too 80’s for you, but you still want to see your daily intake at quickly, we have a brand new Notification Center widget that shows the same data. The Tabletop Life Podcast explores the fast growing tabletop gaming scene. Popular games are discussed from both sides of the table - the viewpoints of an expert gamer and a newcomer. Let's talk tech! From computing trends, to software development, design, gaming and more, Red Escape is a deep, opinionated dive into the tech and toys we use everyday.